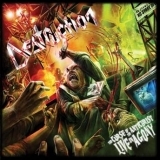 DESTRUCTION - THE CURSE OF THE ANTICHRIST/ LIVE IN AGONY (2CD) | Online Shop | Wizard LTD. Album: "THE CURSE OF THE ANTICHRIST/ LIVE IN AGONY (2CD)"
- AFM REC. 15 YEARS CAMPAIGN! ВРЕМЕННО НАМАЛЕНИЕ!! СЛЕД ИЗЧЕРПВАНЕ НА ОПРЕДЕЛЕНИТЕ КОЛИЧЕСТВА ЦЕНАТА СЕ ВРЪЩА НА СТАРОТО НИВО! After DESTRUCTION successfully celebrated their 25th anniversary in 2009 immediately plans came up to give the fans also a new live album that should include songs from all episodes of DESTRUCTION’s career. “The Curse Of The Antichrist - Live In Agony” is a 2-CD (also available as 2-vinyl) that includes all hits and and fan favourites from the 25 years band history.